If you follow me on Instagram (MissMuffcake) you will have seen these photos. Here are the photos plus added content! 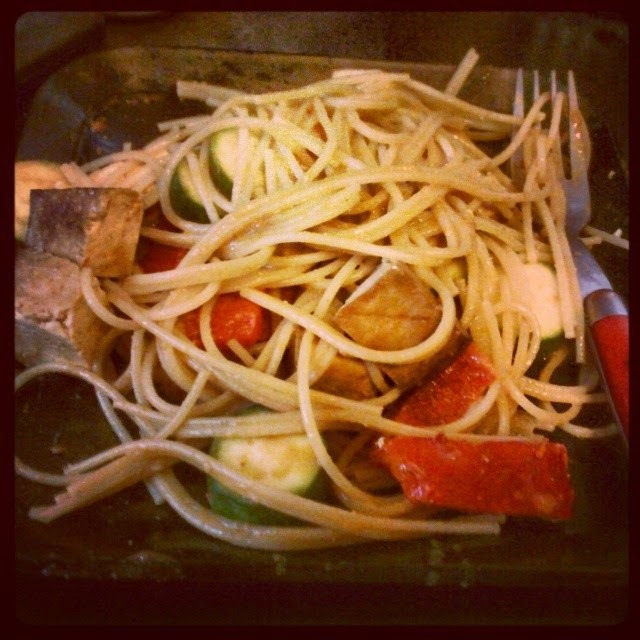 Spicy peanut sauce tossed with whole wheat noodles, organic veggies and savory baked tofu. Post gym meal that is easy to put together and helps our body recover. On Tuesday after the gym I usually make us some sort of stir fry dish and have been trying new sauces out the last few rounds. Matt said he like mixing peanut butter cups with popcorn at the movie theater so I came up with this popcorn treat. 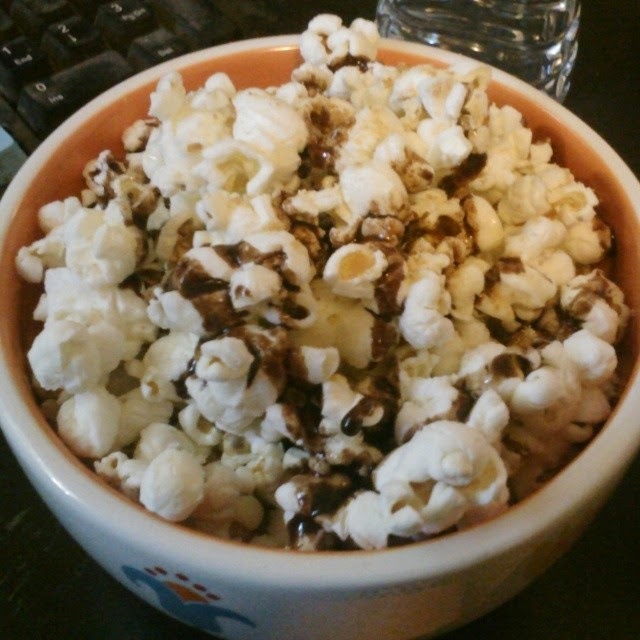 Coconut oil popcorn sprinkled with vegan buttery spread, pink salt, PB2 (powder not mixed with water, just want a light coating) and a drizzle of chocolate syrup. Salty + sweet = yummy! At Matt's work every Wednesday an organic farmer comes out and you can buy fruits, veggies, spices and flowers from her. We got the $5 CSA box last week and it was jam packed with cool stuff we have never tried before. My favorite thing from the box was the Thai Bitter Melon. I thought it was an eggplant but once I cut it open I knew it was a melon of sorts. I liked it with a sprinkling of Tajin seasoning and raw, but I know it is popular in soups and stir fries. I did not find it bitter at all, more like a not so sweet cantaloupe. Last week was a score of fresh fruits and veggies. We got so many peppers from our neighbor that I pickled two batches - we are already out of one batch - peppers on everything! Yesterday we scored a few plump garden tomatoes! I really want a garden of my own. I think maybe this coming year it will happen, I am very inspired! I do have pomegranates and this will be a big haul this season! Some of the stuff from my recent Vegan Essentials order. I have tried the crackers before but am curious about the mac & cheeze and will cook it this weekend. I love the crackers with - yup you guessed it: peanut butter! As Matt and I transition away from palm oil products I am not sure how I feel about EB - they seem honest in trying to be conservatives of land and respectful. Other companies just ignore the issue. We have already stopped buying certain products and stopped buying from companies that use palm oil and who do not address the issue.